Let’s talk about the importance of a shelter… We all live in varying climates, terrain and areas. Some of you may live in the city, in a small town, in the country or in the wilderness as we do. No matter where you are located, the first thing you need to be concerned about in a survival situation is where you will take shelter. If you live in the city, you may need to sleep in your car or dependent on the situation you may need to humble yourself and sleep in a dumpster. You need to be prepared and yet creative at the same time. One thing we carry in our survival packs is either a cheap tarp or a survival shelter system. Now those systems are great and a tarp is great, BUT what if you don’t have one? You need to know how to utilize what is in your surroundings that you could use to create yourself a shelter. We are surrounded by tall timbers, pines to be exact and we are surrounded by the wilderness so there are fallen trees and varying things in our direct surroundings that would provide a great form of shelter making materials. Some of you may have caves or varying terrain that would also provide a fantastic form of shelter. We go out as a family regularly and practice creating all kinds and forms of shelters. This is for fun really, but at the same time it is perfecting our skills and providing us knowledge in varying forms of shelters dependent on our situation and our surroundings. A survival situation may occur in the most inopportune times so our knowledge and skills could be essential as well for our survival. We can’t express enough how important it is to practice your skills and knowledge. Without a shelter of some kind we are leaving ourselves very vulnerable to mother nature. Being vulnerable could lead to a life and death situation. Your core temperature needs to be guarded and protected. What is your core temperature you ask? Your bodies core temperature is your bodies internal temperature. That core temperature needs to be protected or you risk hypothermia. Now, most people associate hypothermia as only something to be concerned about when there is snow on the ground, during cold temperatures or when you fall into a river during the winter months, but what people don’t realize is that Florida has the highest rate of hypothermia. Why? Because in the heat of Florida there is a lot of rain and when people are caught outside in the rain and the temperatures drop into even the 60’s you will get cold and will alter your core temperature unless you are able to take shelter and get warm. So not only is a shelter important, but so is being able to keep your core temperature in check. So dependent where you are located you may need to cool your body if you are in the high dessert or you may need to warm your body if your are in Idaho in the winter for example. So a shelter from the sun or shelter from the elements – either way you need to be creative and create yourself a form of shelter. In the high dessert, a shelter will keep your body from over heating and also dehydrating during the day, but the temperatures drop at night and a fire would still be necessary for your survival. Here in Idaho, a situation in the winter months here would require a quick shelter and an immediate fire so being prepared is essential. Something else you need to consider in this situation is over exerting yourself. If you are in the high dessert you want to take your time and get a shelter in place with as little exertion as possible, not to burn up too many of your calories, to sweat too much which would cause dehydration and even the possibility of hypothermia dependent on the time of day. In other locations where the temperatures are colder you definitely want to take care not to sweat by removing a top layer of clothing while you build your shelter and gather fire starting materials. You do also need to be concerned about over exertion too and burning up too many calories as well. Keeping yourself strong and able and your core temperature safe is the most important part right now while you build yourself a shelter and work toward starting a fire to keep your body warm. Again being creative may be necessary. Dependent on where you are located you will need to find dry materials to start your fire and materials to keep your fire going. Later this month you will be able to read my post on What Is Char and Why You Should Have It To Start A Fire, but for now let’s talk about a couple of things. Right now as I type this, I have a pocket knife in my pocket and two Bic lighters and I have one of our Mountain Boy’s survival bracelets that he sells on my wrist. In these simple pieces of equipment, I have all I need to build a shelter and start a fire. They are on my person, ALL the time. That way no matter what, I have what I need to be creative, but also safe. The knife can be used to cut up the paracord to tie down various things I find in my surroundings to build a shelter, to secure a tarp to a tree (with a million other uses). I have a lighter to start my fire with materials in my surroundings, dried grass, fungus, small twigs, etc in my personal surroundings. You may find cardboard in the dumpster, your car may have broken down and you have some old directions in your glove box, a dirty napkin, and varying things outside of your car that you can use to keep your fire going. In the dumpster you could keep feeding the fire with the cardboard or maybe there is a skid or pallet there for the trash, a sofa cushion. Think out of the box and be creative. So now you are aware of the need for a shelter and a fire. These are critical for your survival in any situation, shelter and warmth and keeping your core temperature protected form hypothermia. 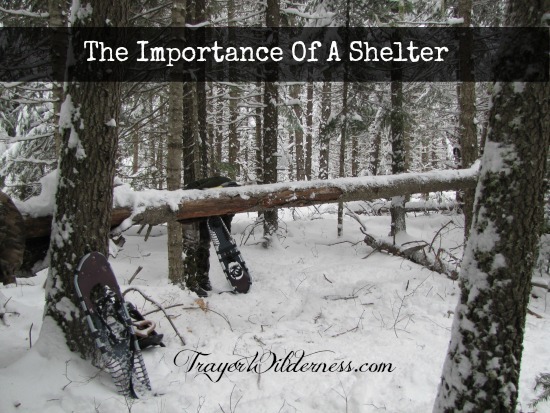 Be sure to read my upcoming post on How To Make A Shelter and What Is Char and Why You Should Have It To Start A Fire. We will talk more about building a shelter, but below will be two locations that I recommend the people behind the products as well as the shelter systems they carry. Also remember, being prepared does not mean we need to go broke in purchasing products, you can easily start with a cheap tarp which you will see in our videos upcoming on shelter building and you can use materials from your surroundings. The best advice I can give you right now is to be knowledgeable, practice your skills, use common sense and be creative! For you ladies especially, I will be doing a Shelter Building Survival Series this fall so be sure to subscribe to our newsletter here: http://eepurl.com/MzMfj, so you are the first to know about it…. Be sure to join us and subscribe to our YouTube Channel at TrayerWilderness. Do you need help in learning how to build a shelter? What is your favorite type of shelter?